Tweet My Mommy Squader, Amanda, recently threw her little one an Ice Cream Shoppe themed Birthday Party for her 2nd Birthday. 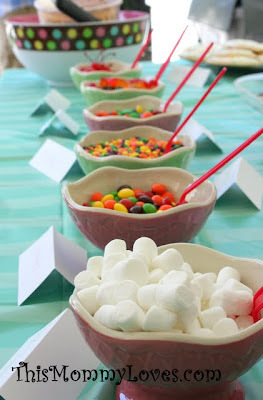 She did such a great job and incorporated such cute details to make the party a smashing success. 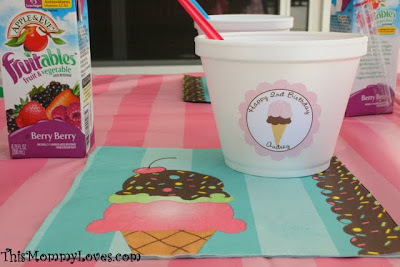 Ice Cream Banner puchased from Michaels. 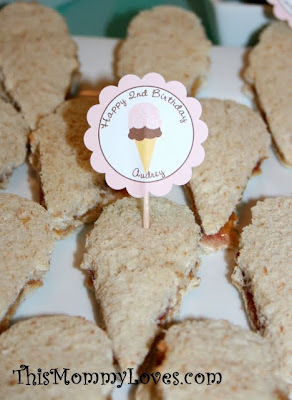 PB&J's cut into ice cream cone shapes! Such an adorable twist on Pom Poms. 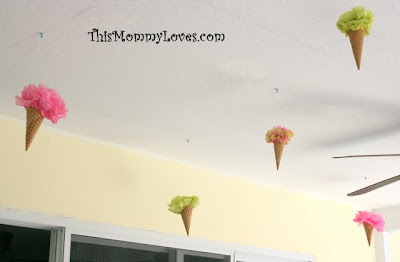 Add a Ice Cream Cone and just hang from the ceiling! So cute, right?! Here's how you make the pom poms. 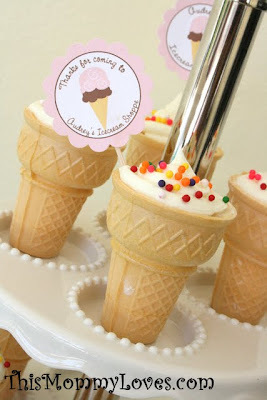 These were cupcakes in ice cream cones! So cute and actually very functional as an easy way for toddlers to eat cupcakes. Tutorial coming soon! 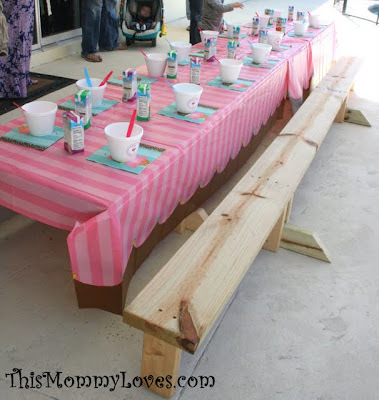 The perfect toddler-size picnic Table that my Handy Husband constructed for our daughter's Pancakes and Pajamas Party. The table was such a hit, it's being passed around the playgroup for parties. 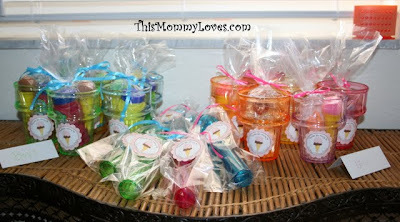 The Favors: Ice Cream Scoops for the adults and Ice Cream cups for the kids with little ice cream shaped toys inside. 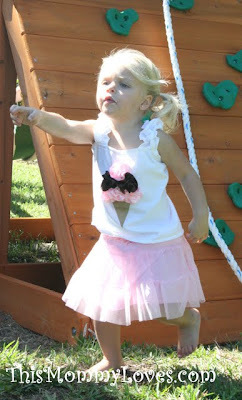 And last but not least, the cute Bday girl with her ice cream cone shirt. This was from Etsy but Amanda said she couldn't give the shop a recommendation due to poor communcation and order speed. It did turn out adorable though! 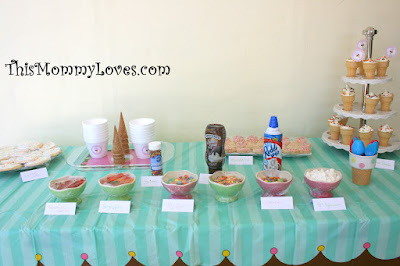 And that's how you throw an Ice Cream themed birthday party! I *love* this theme! I'm definitely filing this one away :) Thanks for sharing! What a fun party! It looks amazing! 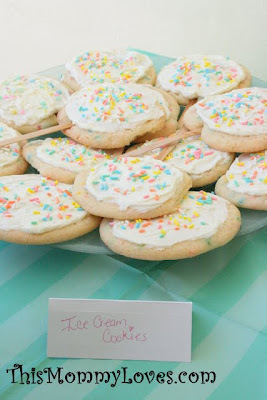 Fabulous party...I know my kiddos would love an Ice Cream party anytime! Wow!! This is totally amazing and beautiful! Such an adorable theme! I am happy to be your newest follower and would love to have you as a friend at Frou Frou Decor! 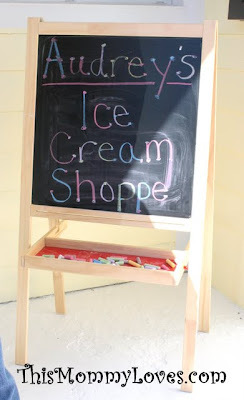 Also, be sure to link up your sweet creations each Friday at my Fabulous Friday Finds party! Hope to see you there! oh i LOVE this! great ideas! So many cute ideas! Love the pom-pom cones from the ceiling. That turned out adorable! 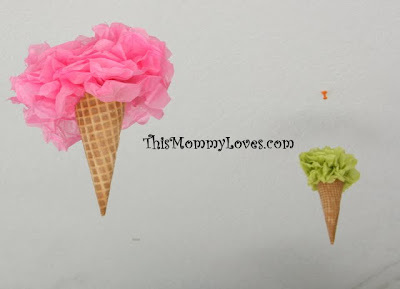 I love the pom pom ice cream cones! What a fun party!! Love all the details! This is just adorable!! You made everything perfect. 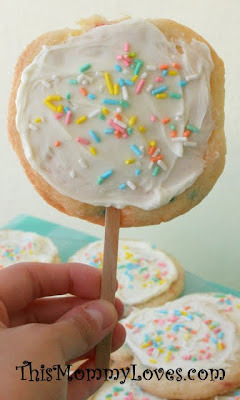 :) I love the rice krispy treats and the cookie pops. SOOOO stinkin perfect! (have you sent this to Design Dazzle?) Do it A-SAP! This is so adorable. I like the twist on the pom-poms. How did you shape the rice crispy treats? When they were still warm or after they were chilled? 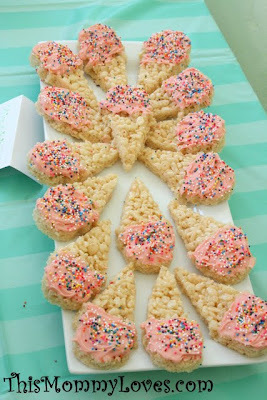 I'd like to do shaped treats for my daughter's upcoming birthday party. Absolutely adorable. I bet everyone was blown away by all of the incredible details. I know I am! Saw your party on Party Like a Kid. I love it even more because I also threw an ice cream birthday party for my daughter Audrey in September. 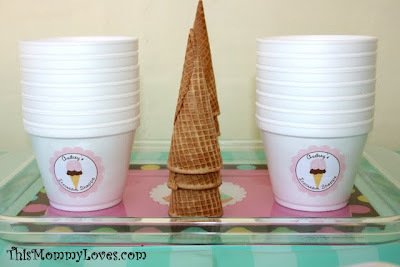 Can you tell me where you bought the styrofoam ice cream cups? These are perfect for serving. wow! 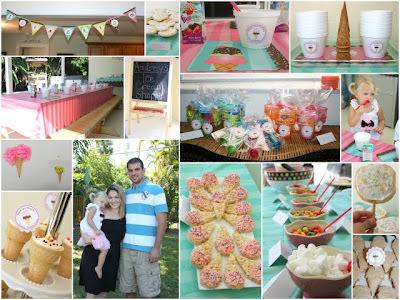 I have never seen an ice cream themed party before! It's awesome! I know this is a crazy request....but I'm doing an ice cream party next week also for my daughter with the exact same line you bought. But since I bought mine last year and they aren't available anymore I am needing one more of the large polka dot bowls. If you still have yours would you be willing to sell it to me? I would be forever grateful. Love your party too! Can you tell me how you attached the cones to the tissue paper pom poms? So cute! I'm sure I'll have more questions as I head out to the store tomorrow! You did such a great job!! I love it! I just created an inspiration board on my blog and this gives me some added ideas. Thanks! How do you connect the ice cream cone to the pom pom? Where did you buy the table covers? p.s. where did you get your favors??? cute!